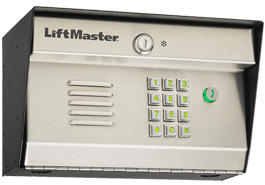 The LiftMaster® Model EL1SS System provides wired communication and secure access control at the gate or door. Hardwired for power and connected directly to your existing telephone line, the EL1SS greets visitors with a high visibility back-lit keypad and attractive styling. Easy-to-install design saves an average of 10 minutes on installation time over older models. Simple design makes it ideal for residents and visitors to communicate and grant or deny access. Weather-resistant and durable design is ideal for the outdoors. Remote open feature opens two entrances independently from your home or office. Intercom mode makes use of existing telephone systems, even if your customers have a “cellular only” home. Unique ringing lets your customers know when a visitor is calling from the gate or door. Call waiting allows your customers to answer an incoming guest call while on another line. Call forward allows your customers to greet visitors, even when they are not home. Do not disturb mode offers additional privacy and is activated easily on your customer’s phone. Party mode is designed to conveniently hold open the entryway. 200 (4-digit) unique, programmable entry codes provide convenient assigned access. Vacation mode locks the system down when no one is home. Durable metal keypad with green backlighting increases visibility for nighttime viewing. Call button is illuminated so visitors can locate it easily.